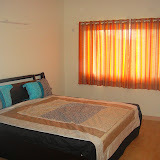 What exactly do you get for INR 20K/month rental in Bangalore? When I tried asking this question before coming here, the standard answer was …”well it depends you see“. I don’t blame them. It actually really depends. It depends on the city, location, amenities et al. But I don’t think it yet depends on the schools (like in the US). I was told that you should look at anywhere from INR 15K/month – INR 20K/month + monthly maintenance. But then sitting there, you would still like to get an idea. My friend who is coming down here certainly likes to know. So here it is my friend and for all those of you who want to know, the details of a INR 20K house. Disclaimer: This post is permanent, but not the rates. The below is valid only as of late 2009 and probably not valid for all areas of Bangalore. Certainly, you can get bigger houses for lesser here in Bangalore as of today. But then they would either be far away from your office or do not have the amenities which is the key here. Why we Indians are like this! !